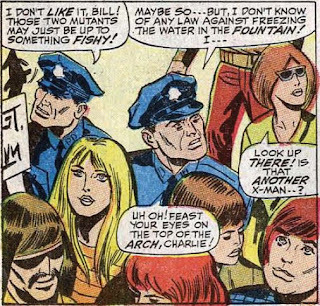 Meanwhile, Beast and Iceman entertain a crowd in Central Park using their powers in the hopes of receiving donations. 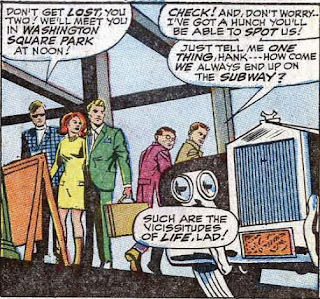 The other X-Men arrive on the scene, driven there by a young man named Tom Regal. Seeing the crowd distracted by Beast and Iceman, Tom dons an experimental exoskeleton and announces himself as Mekano, stating that Beast and Iceman are his accomplices. With the police's efforts thus divided, Mekano begins destroying the nearby library. The X-Men try to stop him, eventually bringing his rampage to a halt after Marvel Girl saves his life. Tom's father, a wealthy philanthropist who paid to build the library, arrives on the scene as Mekano is unmasked. Tom was determined to destroy the library because his dad paid more attention to it than to him, but realizes now how foolish he was. Tom's dad realizes he's been neglecting his son, and vows to make amends. In gratitude, he loans the X-Men the money they need to fly to Europe. Needless to say, Mekano, spoiled rich kid Tom Regal, who dons an exoskeleton to trash his dad's big philanthropy project in order to get his attention, appears for the last time as well as the first in this issue. We're not exactly dealing with a Magneto or a Juggernaut here. Ross Andru debuts as the new regular artist, though he'll only stick around for two issues. He's most known for a lengthy run on Amazing Spider-Man, during which he co-created the Punisher. He was also the penciller of the first Marvel/DC crossover comic, the tabloid-sized Superman vs. The Amazing Spider-Man. His greatest contribution to X-Men is designing their new uniforms, which will debut in a few issues (after he's left the book). Marvel Girl is much more powerful, able to telekinetically lift steel girders (though she still feels the strain). Roy Thomas pulls Stan Lee's old trick of referring to her telekinetic power as teleportation. 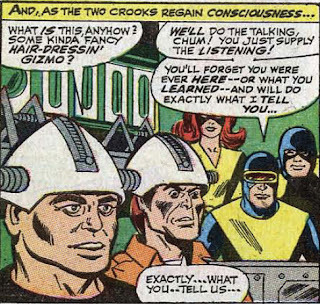 Professor X may be captured, but his spirit lives on: the X-Men use Cerebro to wipe the memories of two burglars who attempted to rob the mansion and to plant hypnotic suggestions that they turn themselves over to the police. 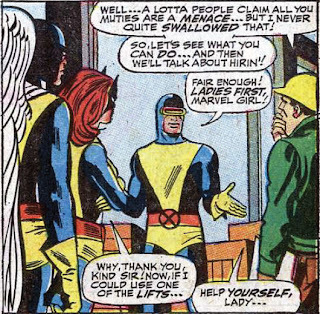 The whole plot involving the X-Men trying to drum up some cash is very "Marvel in the 60s". 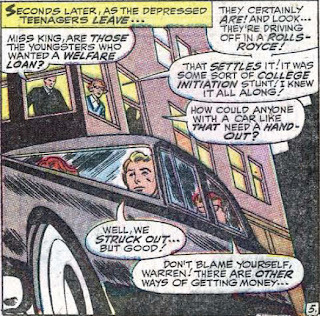 Apparently back in the day you could just stroll into a welfare office and apply for a loan on the grounds of "I'm poor and need money" (which Angel and Marvel Girl do in this issue, but are turned away because the loan officer spies the Professor's Rolls Royce parked outside). The resolution to Mekano's "rampage" is downright laughable, with his father tripping over himself to take the blame for his son becoming a wannabe super-villain. \və-ˈsi-sə-ˌtüd, vī-, -ˌtyüd\ Noun. A favorable or unfavorable event or situation that occurs by chance; a fluctuation of state or conditions of daily life. Throughout the issue, much is made of the public's general fear and distrust of mutants. 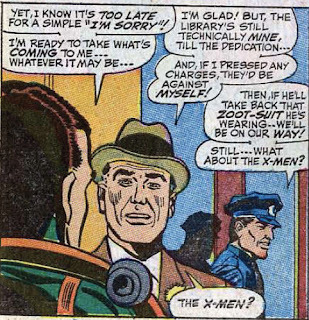 The construction site foreman has heard bad things about mutants, but is willing to see what they can do, while the cops in Central Park are generally anxious about Beast and Iceman's antics. 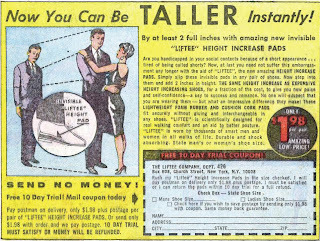 Is being short keeping YOU from meeting the girl of your dreams? Well, this is downright absurd. While Professor X is in the clutches of an evil international organization, the X-Men busk for cash. Thomas falls back on his second favorite narrative device, a less than inspired villain, in Mekano, whose motivation for villainy is on par with Lex Luthor's one-time "Superboy made me bald!" rationale. It's all ridiculous in classic Silver Age fashion, and while tonally dissident from the looming menace of Factor Three, not without its charms. It's certainly the kind of story you'd never see nowadays, and there's something fun in that. Soooo... Let me get this straight - Cyke can choose between destroying things with his eyes...or lifting them? How is he not Marvel Girl? Cyke can choose between destroying things with his eyes...or lifting them? That seems to be the long and the short of it. It puzzles me too. Thankfully, much like Mekano, I don't think that particular panel every gets referenced again, so we can probably just chalk it up as yet another Silver Age abnormality. Superboy made Lex Luthor bald?! @Anne: LOL yeah. Back in the 60s, the stated motivation for Lex Luthor's hatred of Superman stemmed from an incident in childhood when teenaged scientist Lex was working in his lab and accidentally started a fire. Superboy came to rescue him, blowing out the flames with his super breath and, in the process, accidentally blowing chemicals onto Lex's head which permanently turned him bald. So while Superboy saved Lex's life, Lex was mad that he did so in such a sloppy manner which resulted in his permanent balding, and carried a grudge from that day forward. Needless to say, the modern incarnation of the character has been assigned a less petty and stupid reason for hating Superman. My fave writeup yet! I wish I'd been in on these from the start. Oh, 1960s Marvel. There's Peter Parker not having the dough to take Gwen Stacy out on the town, and then there's Warren Worthington not being able to the foot the bill for a transAtlantic rescue mission. Cyclops, Angel and Marvel Girl try to get work at a construction site but are unable to do so because they aren't members of the union. But it was an awesome idea because they'd have all the money they needed as soon as they were hired! In addition to the monarchical connotation of his family name, Tom Regal spelled backwards is la germot, which is French for "While I respect his journeyman career and know he has plenty of admirers, I've never liked Ross Andru's work." They're supposed to be concussive blasts, remember, so if the vectors were right he could apply enough force towards the machine to keep it from hitting the ground while not applying so much as to repel it back the way it came down or wrench it apart. PS: I don't know whether you care (and you may indeed already know this), but "George Bell" was George Roussos. Falen: How is he not Marvel Girl? 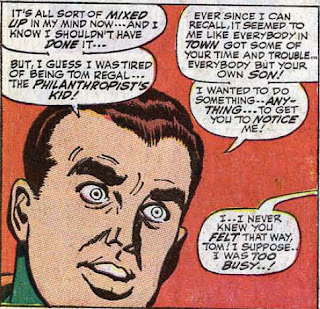 Yeah, the whole "we need money" bit is very 60s Marvel. I'm pretty sure everyone except maybe the Avengers had at least an issue or two where they were hard up for cash at a critical juncture. The funny thing about the construction job is that Thomas actually sets it up so that if not for their lack of Union membership, it would have worked. They show off their powers, impress the foreman, he agrees to pay them in cash that day and then...uh oh, not part of the union, and the foreman's not having any of the trouble that comes from hiring non-union workers. Tom Regal spelled backwards is la germot, which is French for "While I respect his journeyman career and know he has plenty of admirers, I've never liked Ross Andru's work." Yeah, he's never done much for me, either. I know some people that hold his Spidey run in high esteem, but I enjoy the work of some of his contemporaries much more. The problem, I think, with Cyclops blast, is that the vectors weren't right (or, at least, not drawn correctly). I could see it if Cyclops was on his back, firing up at a falling reading machine, using his blast with enough force to stop its descent but not so much as to send it flying into the air (similar to how, when falling, Cyclops can pulse his blast into the ground beneath him to slow his descent). In this case, though, the art suggests the machine is coming *towards* Cyclops. 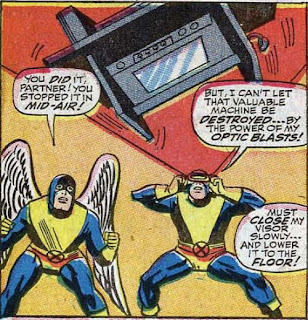 So to me, Cyclops' beam could hold the machine in place horizontally (he uses enough force to slow its approach to him, but not enough to destroy it), but not vertically, because eventually gravity would pull the machine to the floor, and since Cyclops isn't under the machine, his blast wouldn't be able to keep it up. Unless he somehow angled his blast in such a way that it bounced from off the floor up and under the machine. Which is probably possible, but beyond the concern or ability of Andru to depict. I dunno, maybe my science is just all off and it does make perfect sense. "George Bell" was George Roussos. I did *not* know that. Good to know! Also, the angst. Lots of angst. Marvel Girl won't get that until she becomes Phoenix. Gotta love the 1960s Silver Age. 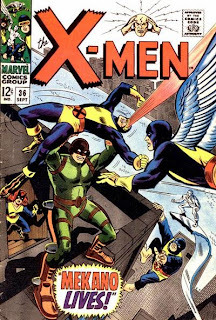 I never read much of the early X-Men issues -- I got started with them during the Chris Claremont run. My favs of the Silver Age were Spiderman (of course), Silver Surfer, and the ultra-campy early Daredevil books. I love the write-up, Teebore. This is fun stuff. The panel pics are terrific and bring everything to life. Glad you enjoyed it, Ambivalentman, and thanks! I first got into X-Men during the heyday of the 90s, and went back and got caught up on the Claremont run from there. I've read this Silver Age stuff maybe once before thanks to reprints and such, so I'm finding a lot of things I missed the first time around as I do these posts. The panel pics are all thanks to a fantastic DVD ROM Marvel licensed a few years back that includes every issue from #1 to the then-present (circa 2004, I think). They put out a bunch of them for different series around that time, but most have since gone out of print. I managed to get my hands on the Spider-Man and Avengers sets, as well, and have thought about doing similar posts for those series as well, but just haven't found the time yet. I'd love to do a series on Daredevil. Those Silver Age issues rival some of DC's output at the time in terms of sheer comic book insanity, such as Mike Murdock. There's also a Silver Age issue of Fantastic Four (#35, I think?) which has a similar ending. The "villain" of the issue is some super-rich guy called Gideon, who gets asked to defeat the FF, but his son, whom he neglects, ends up saving them. It's one of the lower points in the Lee/Kirby run. ...Angel and Marvel Girl do in this issue, but are turned away because the loan officer spies the Professor's Rolls Royce parked outside. So why don't they sell the damn car if they need money that badly?! @Teebore:Yeah, the whole "we need money" bit is very 60s Marvel. I'm pretty sure everyone except maybe the Avengers had at least an issue or two where they were hard up for cash at a critical juncture. Oh, please tell me that you haven't given up on this idea! @Harry: So why don't they sell the damn car if they need money that badly?! I'm amazed neither the X-Men nor Roy Thomas thought of that. No, but covering Daredevil is probably at the bottom of the list, after Avengers, GI Joe and something with Spider-Man. But, if I can ever figure out a way to blog full time, it'll happen sooner rather than later! @Teebore:No, but covering Daredevil is probably at the bottom of the list, after Avengers, GI Joe and something with Spider-Man. Ooh, yeah, I'd love to see your take on Silver Age Spider-Man. I've got every Essential volume of Spider-Man, and there's some stuff in there that you'll absolutely love.